You want to move to Canada if Trump wins? Apply here. 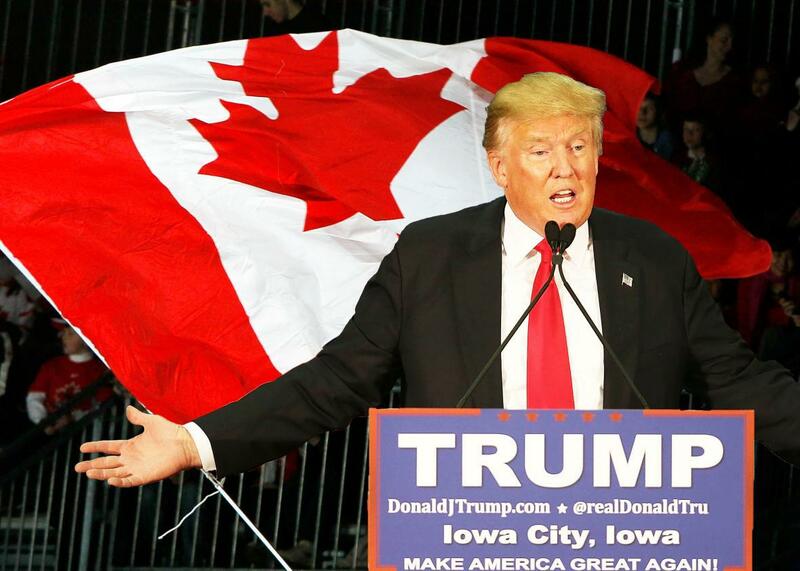 You Want to Move to Canada if Trump Wins? Canadians for a less Trumpy tomorrow. Photo illustration by Slate. Photos by Kevin C. Cox/Getty Images and Joe Raedle/Getty Images. THIS EMAIL WAS AUTOMATICALLY GENERATED, AS I AM CURRENTLY OUT OF THE OFFICE AND OVERWHELMED BY REQUESTS FOR HELP ACQUIRING A CANADIAN “PINK CARD,” WHICH IS WHAT I ASSUME AMERICANS THINK WE CALL OUR GREEN CARD. In light of recent indices that your next elected leader may in fact be a man who makes George W. Bush look like a governmental visionary, I have recently been deluged with requests to move to/seek temporary asylum in/camp briefly at my unfinished Canadian basement. Please know, my new, terrified horde of American best- friends-I-haven’t-met-yet, that I am processing your applications as quickly as I possibly can. Right now, my two grown children are in my unfinished basement, sorting through the mounting stack of letters, emails, Facebook friend requests, half-used Starbucks cards, and cash inducements you have been sending me in your efforts to reserve your small slice of my Glittering Northern Paradise (unfinished basement). To make matters more severe, the re-emergence of your fake Canadian icon and poet laureate of cray-cray has contributed to a significant uptick in the application letters and overt bribes I am currently fielding. That said, I send this mass out-of-office reply to advise you that while I am absolutely and sympathetically considering your family’s plight, your application for permanent residence in my unfinished Canadian basement catches me, apologetically, not in a position to proffer final lease agreements at this time. As I type, my aging parents are drafting final agreements in my unfinished basement while I sip on your generously supplied Starbucks grande chai lattes. But before I formally process your various requests for rental space, I would like to please stipulate the following terms and conditions in advance. Thank you so much for bearing with us, American soon-to-be friends! We promise a delightful if frigid future and a bare minimum of reminding you that we whupped you in the war of 1812! Parce que pour faire serait présomptueux et complètement anti-Canadien. 1. Showers: We have two. Should you be the lucky beneficiary of a coveted square metre on my basement floor (see No. 2, “metric system,” below), we will need to work out a shared system. I would propose that the Bernie people get Mondays, Wednesdays, and Fridays, Hillary people get Tuesdays, Thursdays, and Saturdays. My family and I will take Sundays. The O’Malley guy can use the kitchen faucet. 2. Metric system: We use it. You should learn it. When we are forced to build (and pay for!) the “Trump Wall Norte” along our southern border (perhaps because of the excessive migration that your many letters hint at? ), we might need your cheap physical labor! To us, in a most loving and respectful way, the USA has always been Canada’s Mexico. So, the ability to compute concrete amounts in cubic metres could soon come in very handy, and it will also wow your Imperial measure friends. 3. Heat: As you are probably aware, we use a lot of this, especially in our unfinished basement, which is where we used to store the caribou meat, and especially during our winters, which typically last from early August to late July. We are, being generous-of-heart Canadians, prepared to provide you with heat as part of our rental agreement. In exchange for said heat, we would ask only for occasional entertainment, perhaps the staging of an annual pageant re-enacting the GOP primary debates of 2016, or perhaps you can describe for us in song what firing an assault weapon for no reason feels like. 4. Your possessions: Assuming I am able to offer you a space in my basement, you will, of course, have to put most of your personal effects into storage, at least until the eventual ouster of President Trump or the War of 2017 (in which President Trump invades Trinidad so he can write a best-selling book about how much money he made building a golf course there, thereby accidentally triggering a worldwide nuclear disaster, about which he can then write another best-selling book). Whatever personal effects you can’t fit into your square metre (see above) of basement space, or in storage in the city of your original domicile, can be held in our conveniently spacious Yukon Territory, where, I am told, affordable storage space remains plentiful, no doubt due in part to the proximity to Alaska (which post-2017 becomes known as Palinistan). 5. Justin Trudeau: No. You can’t have him. 6. Justin Trudeau (Part Deux): No. We won’t trade him for Ted Cruz back. 7. Hockey: We watch hockey. Only hockey. Throughout our winter (as mentioned above, from early August to late July). So, unless you bring your own flat-screen TV (see “possessions,” above) you will be soon watching hockey too. Congratulations! It’s way better than American football. And there’s fighting, which—from our viewing of your reality television programs—we understand you to enjoy very much. As a side note, your American Netflix will not work here in Canada due to a myriad of complex broadcast rules and rights issues. However, we can promise you that Canadian Netflix’s unlimited supply of Irish Rovers concerts will amuse and delight! 8. Food storage: You are no doubt wondering how we plan to share one midsize kitchen refrigerator among 400 people. I propose that American renters take the top shelf, my family takes the middle shelf, and we reserve the bottom shelf for poutine, Molsons, and maple syrup. Any sightings of Bud or Bud Light in or near the refrigerator will result in your immediate registry in the national database currently being set up in Ottawa to track the whereabouts of dangerous non-Canadians. 9. Your career: I am told they are taking volunteers to erect the big concrete wall (see “metric system,” above). Also if you play hockey, you can DM me and I can advance your application to the local scout who covers the area stretching from our house to our neighborhood rink across the street. 10. Civil rights and civil liberties: It’s true: The growing and possession of marijuana is legal in Canada, as is the right to safe abortions and physician-assisted suicide. I would ask, however, that you not avail yourself of these specific rights from my actual basement. Re: the marijuana, DM me? 11. Justin Trudeau (Part Trois): No, you can’t have Sophie Grégoire-Trudeau either. Justin Bieber, however, is all yours. So welcome, provisionally to my Canadian basement. Our money is many colors. And when you get here, everyone will welcome you with open arms, of course; we’re Canadian. And though I know you’ve inquired as to our basement availability before (remember when the cray-cray poet laureate had a chance to become vice president? ), I won’t hold it against you that it took you so long to follow through. Don’t overindulge in our poutine, and remember, in Canada not shooting strangers over parking spots isn’t just good hygiene—IT’S THE LAW!